I’ve had the opportunity to read a great book called A Theory of Fun for Game Design by Raph Koster, who gets at the heart of some of the questions I’ve been having about creating good games. 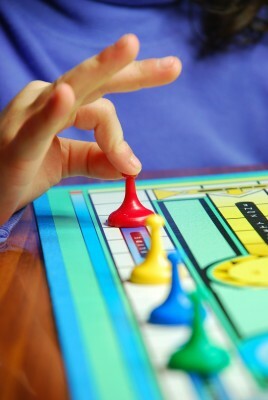 Games are formal, abstract systems in which players can investigate and discern patterns and experiment with these patterns in safety, without fear of losing life, or, in the modern age, social status. According to Koster, a good game is “one that teaches everything it has to offer before the player stops playing.” A very good game has variability and unpredictability, so that the path to success can be changeable each time the player enters the game world. When considering what makes good games addictive, Koster states that “with games, learning is the drug.” Not surprisingly then, Koster sees fun as “the act of mastering a problem mentally.” Fun is tied to the zone of proximal development. We experience the most fun when we are right at the edge of our abilities. If games are about learning, why isn’t school or training fun? So why aren’t school or training activities fun? Although it’s fun to attempt to master a problem, demonstrating you’ve mastered a problem when others are grading you or watching you is much less fun. This isn’t to say, however, that school and training activities can’t be fun, just that there needs to be some protected spaces where the stakes are lowered and where experiments can flourish. Games aren’t stories. Games aren’t about beauty or delight. Games aren’t about jockeying for social status. They stand, in their own right, as something incredibly valuable. Fun is about learning in a context where there is no pressure, and that is why games matter. Although Koster notes that narrative and beautiful graphics are separate elements of games, games can include good stories as part of the game environment and games can certainly include amazingly artistic graphics. Koster’s point is that this isn’t the essential nature of a game. A bad game can be very graphically pleasing but still a bad game. “All the dressing in the world won’t change iceberg lettuce to roast turkey.” At the same time, a mismatch between these outer trappings and the essential nature of the game can also make for a bad game experience. In games that are created as part of training exercises, I’d also add that “interest” is also contextual. That interest has to be strong enough to trump the feeling that the game is pulling the player away from an important project with a hard deadline and therefore creating levels of discomfort that will accompany the player into the game. Not only are protected spaces required, protected time is required. Serious games are games designed to create an understanding of social issues and/or to engage players in behaviors that may achieve positive outcomes outside of the game (e.g., wellness behaviors, social connections for public good, etc). Koster doesn’t directly identify “serious games” as such because for Koster all good games should illuminate the human condition. Whether or not you buy into the idea that “serious games” represent a bona fide separate sub-discipline of gaming, I’d argue that games designed with more attention to outcomes that are challenging and more directly and obviously connected to social concerns should still be fun. It’s because these games remain at heart about learning and exploring and creating. In my opinion, you can’t achieve a serious intent without this exploration. Koster doesn’t say that leaderboards and points can’t be part of games but I think he is pointing out that a player who feels as if he or she is learning in a game doesn’t necessarily need to beat other players to have that experience validated. Koster urges game designers to be explorers in their own right and not to assume that they know the “correct answers” to a game challenge. Instead, game designers should push the envelope and foster the side of human nature that’s less about power structures and more about creating good. In this sense, game design is not “just a game.” Good game design matters. Koster, R. (2005). A Theory of Fun for Game Design AZ: Paraglyph Press. This entry was posted in elearning, game design, gamification, instructional design approaches, social games and tagged a theory of fun, badges, educational games, fun game design, game design, game mechanics, game points, games, games and learning, games training, gamification, gbl, intrinsic motivation, leaderboards, narration games, play, pointification, Raph Koster, serious games, social impact games, video games. Bookmark the permalink.